So after making a big batch of biscuits the other day, I've been trying to find ways to use them all. My husband would eat dessert three meals a day if he was allowed, so he's always in favor of a sweet breakfast option. 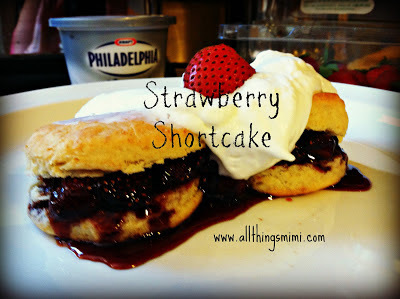 I used my biscuits as the base, then threw together a strawberry compote-ish kinda thing. It actually came out like a really thick strawberry syrup. I chopped about 8 strawberries in smallish chunks and put them in a small sauce pan with about half a cup of dark brown sugar. To that I added a good dash of fig infused balsamic vinegar and a wee dash of Calvados apple brandy. I stirred it occasionally and let it boil on medium heat for about 15 minutes. Next, I whipped some heavy whipping cream in my mixer with about 2 tablespoons of powdered sugar. I split the biscuits, buttered them and added a few spoonfuls of the strawberry mixture. I put the tops on and dolloped the whipped cream on top. I added a fresh strawberry for garnish.